Why does Groot get his own comic? Marketing, sure. Guardians of the Galaxy was a wildly successful movie, thus the appearance of all these new comics and redoing the Marvel Universe Peter Quill into the Marvel Cinematic Universe Peter Quill. Sure. It's a way to make loads of sweet sweet caaaaaash. But why Groot? Rocket Raccoon, I get it. Upcoming Star Lord and Drax comics, I mean, I guess. But Groot? Groot. People, come on! He's a one note character, a one-off Hulk fodder monster rescued from obscurity! He's popular like a catchphrase or a funny sidekick is popular! It's madness! Marketing gone too far! 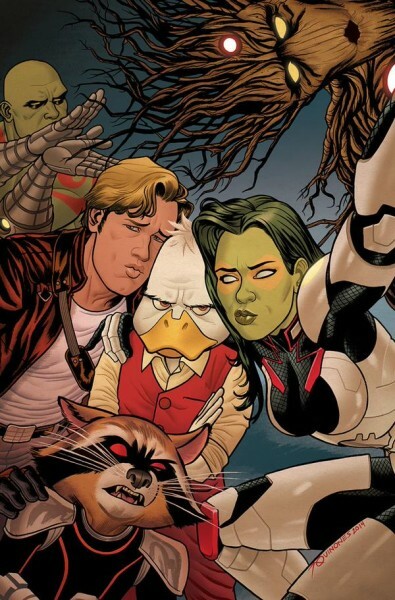 "Oh, but there's a Howard the Duck comic out right now and he was merely in the post credits scene!" Oh, for the--Howard the Duck has a HISTORY. There's some foundation there. Plus, it's a fairly obvious non-canon comedy. It's irreverent. [caption id="attachment_72331" align="aligncenter" width="330"] I CAN'T ESCAPE[/caption] I don't know why this particularly gets under my skin. I accept that this is how Marvel can afford its solid titles. It's business. I don't even blame the artists that make the comic happen. A job is a job. Gotta pay the bills somehow. You know what? I know exactly why this kinda stuff gets under my skin. It's a far too obvious marketing ploy. It cheapens the medium, making the comics feel second to their adaptations. No one was clamoring for a few thousand Guardians of the Galaxy spin offs. It's merely to appeal to passersby in order to sell a few comics. And I love getting new readers! We need more them! But these kind of titles are pandering on an outrageous level. It's not building on the existing material, it's tearing down the existing material and building a half-hearted facsimile in its place. Introduce new readers to your world, don't change your world to make introduction unnecessary. It's a slap to the face to those already here! [caption id="" align="aligncenter" width="576"] Guardians BP (Before Pratt)[/caption] It makes comics like Groot the most market-fueled kind of title (after Star Wars, maybe? At least Star Wars had a palpable user base and a kind of mythos surrounding it--more mythos than freaking Groot that is). It's like the gift shop trinket version of a comic. I guess I just like to think that someone makes a comic because there's something they want to say. That there was an idea that needed to be let out. I understand that the world doesn't really work like that. Hell, some really good stuff can come out of commercial material. It's just that Groot, such a... peripheral character, doesn't really transcend genres. Again, I don't mean to place the buck on any of the creators. I'm sure that they try the best they can. This is an issue found on a much higher level. A level with suits and briefcases. Now, with all that said, I've got an idea for a One Legged Prisoner (as seen in the hit motion picture Guardians of Galaxy) comic!